The table below shows all the failed and partially failed launches from 1988 to 2017. I’ve included the causes of the failures where possible. I wasn’t able to find causes for five of the launches; if anyone has reliable sources on these flights please let me know in the comments section. I’ve included some launches of some boosters such as Zenit and Dnepr boosters that were not totally Russian. 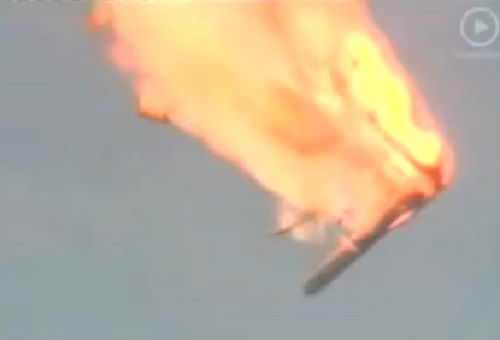 Sea Launch uses boosters composed of Ukrainian and Russian elements. Until 2010, Sea Launch was owned by a consortium of Russian, Ukrainian, American and Norwegian partners. Since then, Sea Launch has been majority owned by Russian companies. Part of the reason they’ve had so many failures is that historically, the Soviet and Russian space programs have tended to launch more times than any of the world’s space powers. When you figure that a certain percentage of all boosters will fail in some way, then you end up with a relatively high number. The breakup of the Soviet Union in 1991 left the space program spread across three countries. Russia retained the majority of the production capacity while most of the rest was in Ukraine. The principle spaceport, Baikonur, ended up in the new nation of Kazakhstan. The chaotic transition to a market economy in the 1990’s also left Russia’s space program in dire straits. Although Russian rockets became competitive in the satellite launch market, there was a serious lack of investment by the federal government in upgrading facilities and developing new space technologies. Russian dominance in the launch market has been challenged in recent years due to failures, quality control problems, and the rise of SpaceX. Russia finished third in launches in 2016 with only 19 behind the United States and China. Russia improved its total to 21 in 2017, which was still low by historical standards. Well, the next question is, what’s their failure *rate*? And then how does that compare with the rest of the industry? Has their failure rate been getting worse recently? Also, does the insurance industry charge more to insure Russian launches compared to coverage for launches from other sources? The failure rate of anything depends upon what baseline interval is being considered. But the recent Russian failure rate/yr. is higher. Of Russia’s significant competitors, only SpaceX has had any failures at all in recent years. Russia had three failures in 2015; SpaceX had one. Russia and SpaceX had one failure each in 2016. Russia had one failure in 2017; SpaceX had none. Even shortening the interval to include only Russian failures since SpaceX’s CRS-7 accident, Russia has had three to SpaceX’s total of two. If one pushes the comparison interval back to SpaceX’s first launch of Falcon 9, things swing lopsidedly further against Russia. That is also true even if one goes far enough back to include all SpaceX’s Falcon 1 failures as well. Has Russia’s failure rate/yr. been getting worse? It got a lot worse from 2011 through 2015. Since then, it seems to have moved back toward “normal.” But the failure-per-launch rate is probably still higher than the pre-2011 norm as Russia has been doing fewer launches these past few years than it typically did earlier and still suffering one or two failures per year. Are Russian launches more expensive to insure? Yes. Hmm. I guess I didn’t word that right. What I meant by “failure rate” was, since Russia used to launch so many more rockets than the US per year, the percentage of failures per 100 launches (extrapolated, if necessary). In other words, if the US launched 25 rockets and lost 1 in a year, and Russia launched 75 and lost 3, than they weren’t necessarily doing any worse even though Russia had more flight failures (in this made up scenario). As an aside to that, low flight rates might yield 100% success but fail to reveal major issues. I worked with the Russians a lot during the Mir program (astronauts flying in Soyuz) as well as Shuttle/Mir and ISS. They talked constantly about using simple, rugged, reliable systems. Certainly the Shuttle was a far far more capable=complex system than the Soyuz as one example. Don’t they also state that their rockets are simpler and more rugged? They make incremental changes instead of a quantum changes like we make. Their failure rate should be near zero if their systems are that reliable. Great table, Doug. Do you also know offhand (or can easily generate) how many launches Russia attempted in each of the covered years? That would be interesting to know, so we could calculate failure rates. I suspect the failure rate per 100 launches has gone up, not down. Not surprising. When you have a program that is under funded, with poorly paid and motivated workers, using old technology and is run by Kremlin appointees who consider skimming off a few Rubles as part of their pay. Really its what you would expect of socialist enterprise. What is surprising is they haven’t killed any Cosmonauts since 1971. Just blind luck probably. But its amazing that NASA thinks the Soyuz is safer that SpaceX’s Dragon2. In terms of the robotic exploration their record its even worst. As far as I recall they have never gotten any mission to successfully work at Mars, they had a few successes on the Moon decades ago, and a couple successes with Venus decades ago. But Thomas, leadership is all about skimming. Why are you offended at government skimming when the whole system you put forward is predicated on skimming? The skimmers you teach kids to advocate for do it in private, and have no public disclosure requirements, and they control or try to control any press coverage in a very soviet manner. They even practice the same secrecy methods by making heavy use of NDA and secrecy contracts. Yes, the Russians have a big problem with leadership taking more than their due from the enterprise they run. But isn’t that a problem in the corporate world as well? Or do you consider it not a problem because it’s a feature of the system? If you want to dig far enough into Soviet cannon, you’ll find that the vanguard of the proletariat are entitled to rewards for being the elite that they are. Surely you don’t have just a selective eye for the corruption of your enemies, while ignoring the corruption of your own camp. Thanks for summarizing this in an easily readable form. Yea, the Russians are not as good in the launch reliability department as they should be given their extensive experience. James Oberg did some very interesting reporting on Soyuz the spacecraft and Soyuz the launcher back when NASA was working towards flying US astronauts in/on Soyuz. It was quite enlightening. Since then, Russia has had some relatively close calls with Soyuz and Progress (which shares a lot of systems with Soyuz). It’s quite scary really. Private firms are governed by their board of directors and ultimately their shareholders who determine the pay of the employees. I am not sure what you mean by “skimming” since in the business world embezzlement or misuse of funds will quickly get you fired or in jail. In a market system, if some executives make more than others it is because the Board of Directors consider them to be worth it, just as sports stars make more because the teams that sign them consider them to be worth it. What is going on in Russia is not based on a free market system, but is even against their written rules. Yes, just as with the Shuttle NASA is playing Technology Russian Roulette with both the ISS and Soyuz. Let’s hope they keep winning. If you actually read about how communist economies work I think you’d be surprised at how market based they were as well. It’s just that the control over resources and people was more lumpy with super concentrations of authority and a vast underworld that grew out of those super concentrations of authority. And like your board of directors approving the compensation of officers in charge of the enterprise, I assure you the equivalent is true for tin pot dictators and Russian style kleptrocrats. It’s all legal, and approved by the relevant governing bodies. So the logic you apply to corporations also applies to foreign governments. Our system is the way it is to keep engineers and companies employed. Part of that is domestically political (example:SLS) The other is security. We keep the rocket guys employed they don’t go work for other people. As is the rest of the worlds power blocs. Russia, the EU, China, India, Japan. It’s no different. Yes, one very low standard for Russia, one very high standard for American firms. And NASA, Apollo1, Challenger and Columbia shows NASA doesn’t always follow even its lax rules. Communist economies replace the role of market decision making with decision by committees, with often no one regulating the committees. They are not market based by definition. Market base means the mass market uses price to make decisions. Firms in the U.S. are regulated by the S.E.C, stock holder groups and ultimately the market when bad decisions make them bankrupt. Toys R Us is the latest example. There are no such controls in a communist economy, short of a public uprising or a change of leadership. Apollo 1 we were over eager, and were still learning, Challenger and Columbia were more programmatic. Yes, NASA is a good example of where market forces are replaced by Congress in keeping pork projects like the SLS going. Price isn’t the only deciding factor, there are always considerations over “Penny-wise, pound-foolish” but that is also effectively price, more now or more later. Not always, NASA and USAF are adopting more and more COTS style programs because market forces work, and in actuality COTS based is a good hybrid of traditional contracting and market decided contracts with cost plus being replaced by the more market beneficial and cost effective firm fixed-price contracts. I will be the first to concede there are times cost plus makes sense but they are the exception not the rule and it should always be used as the exception in contracts. Yeah, that’s what your textbooks say. A second order reading of how industry worked in the USSR, and how it works today in Russia says otherwise. They had a sort of market dynamic as you describe and it was the underworld that tied it all together. There’s no escaping market forces in an economy it’s human nature. But that avoids the main issue of leadership overcompensating themselves. Some systems deal with it better than others. But it’s my reading that overcompensation is the function economies were built to enable, everything else is secondary. And yet they aren’t. As the saying goes, it’s hard to make things foolproof when fools are so inventive. The recent Ariane misadventure just illustrates that there can be weak spots even in long-used procedures that can rear up and bite one even long after all their bugs have presumably been worked out. Ariane 5 had two complete failures and two partials among its first 14 missions. Like SpaceX after both its failures, ArianeSpace fixed its problems and its enviably long string of subsequent successes has been the result. SpaceX, ULA and Ariane Group (as it is now) have proven able to maintain a very high-quality level of execution in their operations. The Russians have not. The insurance companies seem to unanimously agree that the Russian failure rate is significantly worse than those of their competitors. If you have the time, you could compile your own table of Russian failure rates per year, per 100 launches or using any other metric you think appropriate. Wikipedia probably has lists of Soviet and Russian rocket launches that could provide raw data for such an exercise. I have neither sufficient interest nor time to do such a thing myself. Yup the important thing isn’t not failing, it’s not having the same sort of failure twice. But your assumption that a executive in a private firm are overcompensating themselves is subjective and not based on the labor market. Using sports as an example there is only one Michael Jordan, so if you want your team to win the playoffs you will pay his price. Yes, black Markets exist, but they are not part of the system. “Nothing is foolproof to a sufficiently talented fool”. Many other versions of this saying exist. You’re right, it’s subjective. But this subject is by its very nature subjective. I think the solution is a balance of forces. Unions were a good real world solution to the subjective nature of the problem. And the laboratory of history shows that when corporate boards were counterbalanced by labor unions the nation did swimmingly good, and that the downturn of the US economy, education base, and quality of people in general correlates with the increase in freedom corporate boards achieved starting in the 80’s. As for black markets in the Soviet bloc. I love it when you misunderstand something because you don’t know the history, but your theoretical underpinnings allow you to make my point as you try to state a counter factual. You’d really love reading about applied Soviet economics. Nothing moved without the mafia. Not one lump of coal, not one boxcar of iron ore. They were the system. The trick of Soviet economics was how to move resources without use of money. Why would a mine boss who had a pile of coke ship it a iron foundry in Moscow? Why not ship it to another factory? What was their currency? And who were the enforcers? Why would a train operator move the material, and how could he convince a machine tool plant to get him parts? It’s a fascinating history. Failures is a feature on all launch vehicles…. try statistics. Russian tends to launch a lot more rockets than we do. So? The same was also true for the Port of New York in its heyday in the 1930’s and 1940’s. Indeed, the U.S. Navy cut a deal with the Mafia during WWII to keep the east coast harbors around NY safe. As a result there were no real problems from sabotage, the Mafia took care of it in its own way and the Navy didn’t ask any questions. The same was true for many older urban industrial areas and the increased costs for business was one reason firms relocated to the rural south and western U.S., to lower costs from the type of transactions you discuss. So really, ALL economies have an underground element. Indeed, the underground economy in the United States is why so many illegal immigrates are in the United States. But its not the big corporations as much as the medium size agricultural, construction, food and garment industry that hire them. Some economists look at it as a safety value from over regulation of the economy. But it also goes to the problem of motivation. Workers at SpaceX have the motivation of stock options and bonuses to perform. What do the workers in Russia have as incentives? Getting a plaque to put on the wall? For public traded corporations the compensation for executives is reported to the S.E.C, which publishes it on their website. Its not as secretive as in Russia. And skimming is looked for by auditors and regulators, so corruption is minimal in public traded firms, and when found the firms usually suffer – think Enron. Unions lost power because the nature of work changed to require more education and they failed to change with it and to deliver the same benefits as they did when the economy was more industrial. I know its popular for those in science to rant against the salaries of executives in industry, (and sports figures), but its simply a supply and demand issue. The number of high performing managers is less then there are job openings for them, so those that are good get high salaries. And they earn those salaries by the revenues they generate for the firms. By contrast graduate schools insist on producing about twice as many astronomers as there are openings, so salaries stay low and many are forced to leave the field. The same is true in many other STEM fields. I had a good friend who earned his Ph.D. in Astronomy at New Mexico Tech, but could never find a job as an astronomer and ended up returning to school to become a High School science teacher. Sadly that is all too common a story among STEM graduates, which is probably the real reason why so many students, especially women and minorities, steer away from STEM fields to ones where they are able to find work. Again, its a supply and demand issue. In the market is negative feedback that catches up to a group that is too tolerant of high agency costs. In government, we have, …. nothing short of the death of the republic for some of these professional politicians. We keep annoying the Russians with disparagement, boycotts and criticisms, they may decide to show America that they can use their nukes to kill millions. Challenger and Columbia both happened because the shuttle was allowed to keep flying even though it was encountering problems it wasn’t designed for. The Challenger issue was that the SRB o-rings weren’t designed to be exposed to hot combustion gasses (even though it was happening with increasing regularity due to changes in the leak check pressure). The Columbia issue was that the fragile orbiter TPS simply wasn’t designed to be impacted by chunks of foam falling off the ET (which happened on every single space shuttle flight to some degree). When your hardware is single use, manufacturing issues will cause “infant mortality” problems that simply cannot be avoided. The Russians just seem to have more “infant mortality” problems than they should. Much of the problems that the Russians experience have to do with manufacturing. While the designs don’t change (much), manufacturing issues seem to keep cropping up over time. For example, contamination of tanks, plumbing, or engines seems to be a reoccurring problem. A good classic article from the 1990’s on the failure of western methods to become established in the Russian economy that explains why the Russian space program is not much different than the Soviet space program was. I don’t know, it looks like he has more serious political problems at the moment than the U.S. as the Russians are getting restless again. Yes, they do. But does NASA/dod blow up 1 or more a year? And did/does Russia launch that many more? There is going to be a lot more protests unless oil prices rise. As long as they stay this low, Russia is losing money on a daily basis. It isn’t just failure rate, it’s how they respond to it, qa, culture, the maturity of the rocket at time of failure, type of failure and so on. Overall isn’t considered as much, overall Soyuz has a better record than F9 for instance, however a lot of that is from when the people building the rockets had a lot more pride in it, their equipment was newer and in better shape and QA was tighter on all vehicles, not just the ones that were to carry crew. Soyuz has flown so many times that most all the bugs have had time to show themselves. They do still teak the design here and there. ALL their Chief Designers (of any account) are long dead. This comment is unintentionally more hilarious a half year later with Elon Musk of SpaceX.